Quote "...I really feel invigorated and ready to start the week after my Monday morning spin class." Ride to success! Yes you will breathe hard, strive, battle and probably sweat but you will gain stamina you never knew you had. Your body will become an efficient, well running, fat burning machine. Fellow riders, upbeat music and motivating instructors create a vibe to help you reach your fitness goals and guide you through workout phases of warm-up, steady up tempo cadences, sprints, flats, climbs and cool-downs etc. Resistance is controlled by you to make pedalling easy or more difficult thus working to your own intensity. Constant adjustment is normal and the instructors will guide you through when and how to increase or decrease resistance accordingly. Hand positions, pedalling efficiency, form and position on the bike together with good overall technique will also be covered. If you would like to come along and try a class at anytime just give us a call to make sure we have space. Please remember you are welcome to mix and match your classes with any advertised on the website just let me know. Fees are payable by the term but you are welcome to try a few classes on a pay as you go basis to ensure that you are happy with the class. Don't worry if you have missed the first few weeks you can join at any time and we will adjust the fee for the remaining weeks. Although a lot of the classes run full it is always worth ringing or emailing to check if we have space. 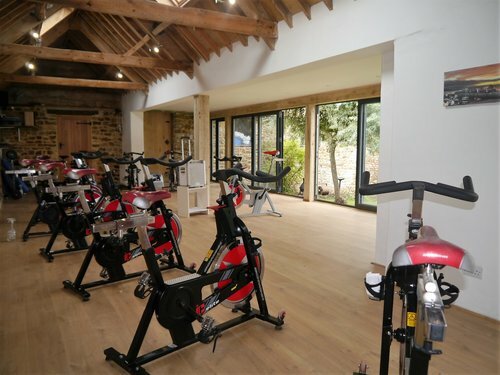 Studio Cycling Classes are all held at our purpose built Blagdon Studio which has room for up to 20 bikes with lots of ventilation and natural light to bring the outdoors in, creating an envigorating riding atmosphere to the class. Mondays at 10.00am with Malcolm Greenslade and Wednesdays at 11.00am with Rosemary Hannam. If you would like to hone your cycling skills, try our Wattbike Pro. It is the first indoor bike that has ever been endorsed by British Cycling and it is now used as their frontline Talent ID screening tool. Key features include the fact that it feels like ‘real’ cycling – on the flat and climbing – and it delivers accurate, repeatable and comparable results. The bike can be used for rehabilitation, general fitness, high level training, scientific testing, cross-training fitness analysis and competition. It features a unique ‘polar display’ that provides immediate feedback on the cyclist’s technique showing the peak force profile of the left and right leg downstroke and creates a profile for your pedalling efficiency. It delivers a new level of depth and accuracy of data all of which can be viewed in real time and saved for later analysis. At one extreme, it is an exercise bike, and at the other, it’s a highly sophisticated sports science analysis bike, making it suitable for everyone from recreational cyclists through to Olympic champions. The bike monitors everything you need to know about your cycling technique and will help to track progress as your training develops. Whether you are looking to monitor your power output (watts), cadence, heart rate and the effectiveness of your pedalling, there is a measurement parameter for you. What you track is up to you. You can train on our Wattbike at our Studio on your own unsupervised, after induction, at a rate of £9 per hour (single user) or with an instructor at £39 per hour. Bring your own CD's or Ipod/MP3 and plug it into our system and away you go. Please book in advance as the popular slot times are quite limited. To discuss or book a Wattbike test session or hire a Wattbike call Malcolm on 07767 366995. For those interested Multi Sports we have Open Water sea swimming courses available with Malcolm Greenslade in Lyme Regis. Check here for Lyme Regis Open Water swimming courses and lessons. Or why not join one of his Swimming Holidays.